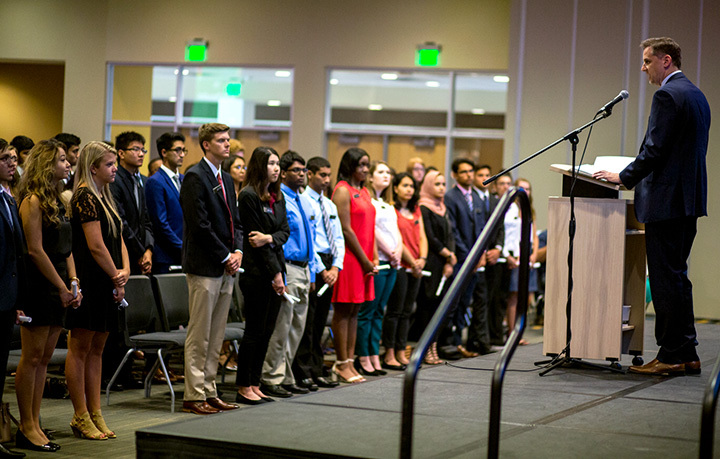 First-year medical students listed as Raymond Cattaneo, M.D., assistant dean for Years I and II medicine, read the Oath of Physicians at the School of Medicine’s 2018 InDOCtrination Ceremony. Throughout the UMKC Student Union auditorium, parents stood with cellphones and tablets to capture the moment a group of 109 students marched in to kick off the UMKC School of Medicine’s InDOCtrination Ceremony on Friday, Aug. 17. The event is a confirmation of the students’ entry to the UMKC School of Medicine, said Brenda Rogers, associate dean for student affairs. She welcomed the Class of 2024 to what she called the challenging and exciting world of medicine. “It’s a world that will demand a lot from you but will reward you greatly,” Rogers said. Each student was introduced as members of their new Year 1 docent unit and then listed to a reading of the Oath of Physicians. It is the same oath the class will recite upon graduation. Second-year medical student Gabriel Calderon received the 2018 Richard T. Garcia Award from Brenda Rogers, M.D., associate dean for student affairs. Second-year medical student Gabriel Calderon received the Richard T. Garcia Memorial Award. The annual award recognizes a second-year student for outstanding leadership skills, compassion toward fellow classmates and outstanding academic performance throughout Year 1. Calderon told the new medical students that test taking will become a way of life. Those tests, he said, will be important because of the payoff. School of Medicine Interim Dean Mary Anne Jackson described her own career path that started with med school at UMKC. She encouraged members of the class to embrace their role as students. Everyone will make contributions in life, and each person’s contributions will be a little bit different, she said. The new first-year class includes students from 14 states ranging from New Jersey to Washington and from Wisconsin to Florida. Of those selected from the nearly 1,500 applicants for this year’s class, women far outnumbered the men, 74 to 35. The Association of American Medical Colleges reported in 2017 that for the first time ever, slightly more women than men entered medical schools across the United States.